Kitt's World: MY FIRST BLOG HOP. Happy New Year and welcome to Kitt's World's and my first participation in a blog hop being hosted by Artistic Inspirations Challenges. There are lots of fabulous prizes to be won from, Robyns Fetish, Sassy Studio Stamping Boutique, and Aurora Wings. 1. Visit the team and leave them all a comment. Don’t forget to pick up the hidden letters along the way, each hidden letter will be a different color or simply added to the end of the post. 3. Comment on the Artistic Inspirations challenge blog telling us where you get your Artistic Inspiration. Email Abbie with your hidden word. We will choose 3 winners from the correct word entries for the Hop Prizes. Be on the look out I know some of the Team have added a little CANDY of their own along the way. including me See details for my blog candy here.. Remember we still have our usual challenge going on... Anything Goes. Here is my DT card using a Sassy Studio image. She is on an action wobble, so she does shimmy/shake. LOL. I cut her out with my Silhouette Cameo and used Spectrum Noir markers EB1,FS2,FS3,CT4,LV1 and a clear glitter gel pen to accent the earrings, bracelet and tambourine symbols. The sentiment was computer generated and the mat was done with Spellbinders scallop nesting die and I used Tim Holtz Tea die distress ink around the edges. You should have arrived here from Pam your next stop will be Fiona. Here is a complete list of the hop in case you get lost on the way. Comment on All DT blogs. Collect all the letters to make 4 words and email Abbie. Thanks so much for taking the time to share your project in the #53 “Anything Goes” Challenge. I really like the shine you put on the earrings, etc. For me, the best part is the Wobble! I can just see that gal doing a shake! How fun! So pretty - love the little touch of glitter. Thanks for joining us at Creative Fingers this week. Cute card! Love the sparkle! Thanks for playing along with 2 Creative Chicks! Like the image. Especially like that she is on a wobble for action movement. Thank you for entering OSAAT Ch 194 Anything Goes. Such a beautiful card, love the cute image. Great time to use a wobble with that fun sentiment. Thank you for sharing this marvelous card with us here at Word Art Wednesday. This is such a cute card and I bet even more fun in person with the wobble action. Thanks for sharing it with us for the Sparkle N Sprinkle Creative Challenge this month. Fab and cute card beautifully coloured. Very pretty. Thank you so much for sharing your lovely creation with us at Challenges 4 Everybody. Beautiful Card. The image is so cute and I love the sentiment. The layout is great and the papers are brilliant. Hi, Kitt: Really ike your card. 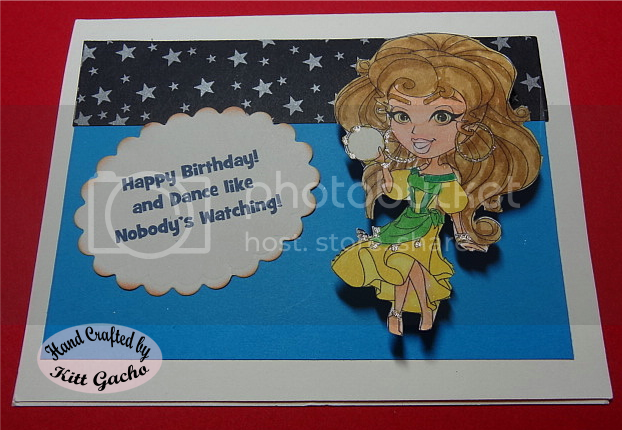 Thanks for entering our Challenge #52 - "Anything Goes"
super cute card! love how you have put her on a wobble brilliant to make her dance!!! I love how you cut out this image and colored it! Great card! I love the sentiment to go with it. Thanks for joining us at Silhouette Challenges! Congrats on your first blog hop - aren't they fun??? Love the wobbly - makes your pretty card that much for fun. Thank you so much for sharing your creativity with us at Di's Design Celebrate Challenge. I want to wish you a wonderful 2014 and I hope you'll join us for our challenges throughout the year! Fantastic image to mount on a wobble! Thanks for joining us this week at the Sister Act Card Challenge! Sheena B. Well that was a perfect idea - to put her on a wobble. Happy dances to you! Thanks for joining the fun at Simply Create Too! Cute card & adorable image! Thanks so much for playing along with our Anything Goes Challenge @ Simply Create Too & hope to see you back again next time!!! Amazing project! Thank you for joining us at Cards Galore Encore Challenge - Anything Goes. I hope you’ll join us in our next challenge. This is such a pretty card !! Thank you so much for joining us at Pile It On Challenges !!! Adorable. Thanks for playing at Hobbycutz challenge blog. we hope to see you next time. Good luck. What a cute card, love it!! Thanks for joining at Sparkle N Sprinkle Creative Challenge, hope to see you again. Great card, Kitt. Love the clean layout. A beautiful card. Thanks for joining us at One Crazy Stamper this month. Happy New Year. I have blog candy!